The last ten days or so haven't gone at all the way I expected, either in my MMO gaming or on Inventory Full. It was only a couple of weeks ago that almost every post here featured a slew of screenshots of Black Desert. In the six weeks or so from the beginning of March to the middle of April I posted twenty-one times about BDO and only about half a dozen times about anything else. And then the posts stopped. They didn't stop because there's nothing more to say about Black Desert. They didn't even stop because I have nothing more to say about Black Desert. Coverage here stopped for the simple reason that I'm not playing the game any more. Oh, I haven't given up playing it. I haven't fallen out of like with it or become bored or disenchanted or anything dramatic like that. I haven't even stopped logging in. In fact "logging in" exactly and accurately describes my current relationship with Black Desert Online. BDO is an MMO to which I log in. Every day I log in my account, click on "Claim Rewards", claim my daily stipend and my token for the event that's running in celebration of the addition of two new classes to the game. Then I log out. After that I log in Mrs Bhagpuss's account, which she bought but so far has never played, and do the same there. I finally get to kill The Wyvern Patriarch in Verdant Brink. It takes about five or ten minutes to go through all the loading screens. It's quite annoying. The only reason I'm doing it is for the free pet that comes with a dozen tokens. Pets are not generally all that easy to come by in BDO unless you want to spend real money so I'm making an effort. On Thursday night, the day Game Update 100 launched, I patched up EQ2. Like Wilhelm, I'm happy to see the game getting this degree of care and attention and I'm also fond of Zek, the zone that's getting the best kind of MMO makeover - an alternate version that complements but doesn't replace the original. I'm also excited about the new Experience Vial system, which might let me play my max level Berserker, something I love doing, while passing the xp he gets, which he doesn't need and can't use, on to my army of lower level characters. 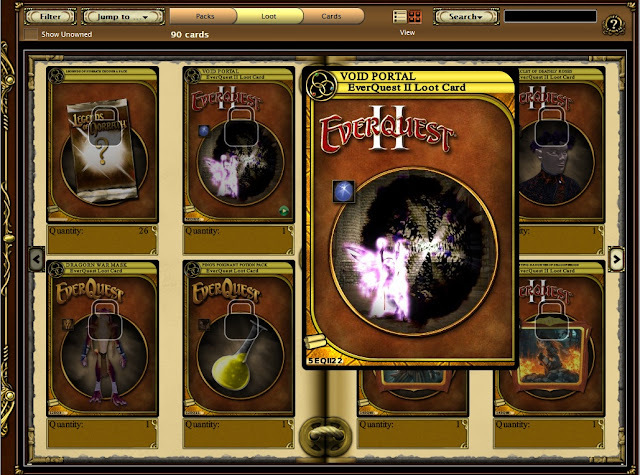 Indeed, just about everything about EQ2's huge, free (for subscribers) update looks good to me. So, if I haven't lost interest in BDO and I'm excited over new content in EQ2, why am I playing neither right now? Nor, for that matter, any the plethora of other MMOs I bang on about wanting to play? And why didn't I post anything at all for most of last week? Moving the Tarnished Traitor out from behind a meta-event locked door so he's now available to be killed at your convenience is emblematic of the new approach. Of course, he still gets killed after the meta too. Bloody GW2, that's why! If ANet's intent was to revitalize interest in their allegedly fading game then the Spring Update has to be considered a major success. Every day since the patch I have actively wanted to play GW2, and I do mean play. Prior to the patch I was often logged for much of the day but I often spent more time tabbed out than I did playing. Not any more. The update achieved two apparently contradictory goals. It made solo play more attractive and rewarding than it has been for months, while simultaneously enhancing and encouraging all forms of group and co-operative play as well. It's remarkable. The Heart of Thorns maps received very significant revamps that make exploring alone not only viable (I would say it always was but that's a minority opinion) but profitable and satisfying too. The changes to Verdant Brink are probably the most significant, radically changing the way the whole map operates, entirely for the better. I've spent a lot of time there and enjoyed it immensely. I don't do dungeons or fractals but if guild chat is anything to go by those have picked up a lot of post-patch attention too. The change that has made the most unexpected impact is probably the simple tweak to the LFG function. The patch simply expanded the range of pre-made, permanent categories under which you can post your group offer or request, but that, plus the ability to join squads via LFG rather than just groups has revolutionized the entire process. It's now extremely easy to find an active, vibrant, buzzing map, filled with motivated players concentrating on completing specific content. As a direct result I've been doing Auric Basin and Dragon's Stand metas for no better reason than that they are really good fun and because I can. Oh, and also because now the rewards are better and you get them as you go along rather than all at the end. Ironically - or perhaps that should be idiotically - even though I've been doing a lot of this on my fresh level 80 Revenant, I still haven't used the free instant level 80 package that came with the patch. I meant to but in trying to game the system I pulled the handle one time too many. 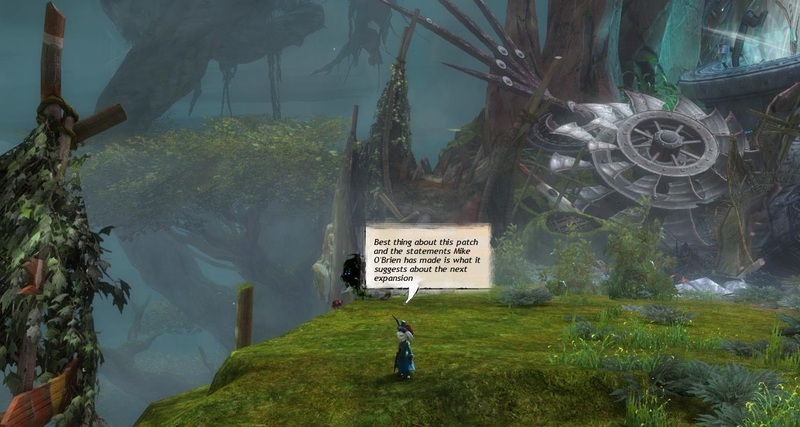 GW2 hands out Tomes of Knowledge like fliers at a festival. I had enough already banked to make three level 80s. I thought I'd be clever and go to 79 with those, thereby bagging all the leveling rewards along the way, including exotics and rares that can be reforged for profit. Only I went all the way to 80 by mistake. That meant a choice: use the Level 80 boost and get only the care package or save it for another new character and get all the free armor and weapons too. I chose to save it but that meant I had to gear up my Revenant the old way (buying stuff with badges and karma mostly) and I now have a level 80 with no waypoints (you get those opened automatically with the free boost). He also needs to do two dozen Heart of Thorns Hero Points for his elite specialization. I'd play WvW if there was literally no other reward beyond server pride, but Stuff is Good. Which is brilliant! It's almost like getting a whole new game. The Revenant, as the new class that came with the expansion, has a whole load of collections to do for armor, plus the weapon specialization. I have all the hero points to get and a whole new set of skills to learn. And that's just PvE. 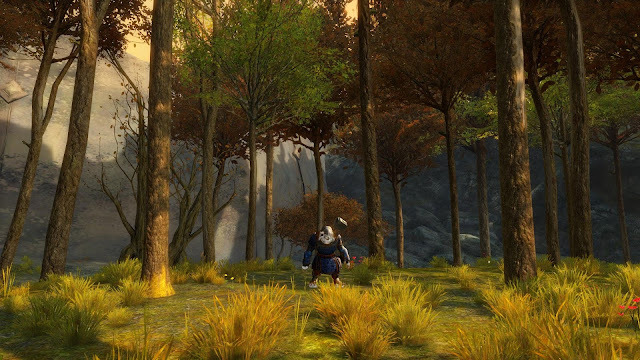 I've actually been spending most of my time in WvW., which has been insane all week. Just climbing up from third place in T1 to finish ahead of Jade Quarry has been a titanic struggle. The resurgent Blackgate hordes are uncontainable. The early part of the week consisted largely of either watching a slideshow until I died without knowing what had killed me or trying to find some quiet borderland backwater where fights were merely zerg vs zerg not gigantonormous blob vs blob. Yak's Bend has always been at its best under pressure and it's been very instructive to hear the reactions of some of our more recent recruits, the players who are used only to seeing YB win. As someone who remembers regularly waking up on a weekend morning to log in and find us ticking in double figures, if we were lucky, this current setback seems like relatively small beer but some people are really feeling the pressure already. This is the part I can help with - running supply, building catas, firing catas, all of that. Once the wall falls and the armies clash, though, I'm on frames per minute not frames per second. Still, they also serve, who only stand and build! What the shake-up has done for me is to heavily re-inforce my already strong sense of server pride. Each evening when I get home from work I find I want to get my dailies done and then find a tag and Do My Bit. It may be mindless, pointless, meaningless pseudo-competition but by the Lord Harry it's fun! 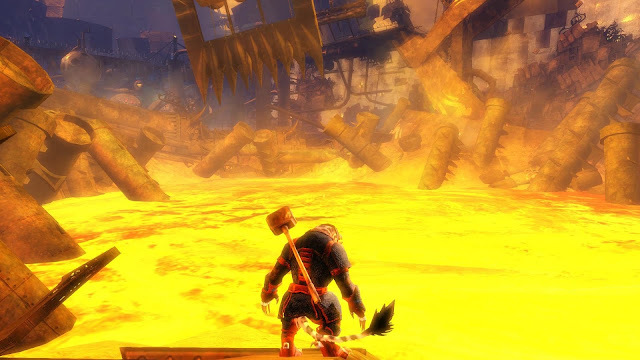 Even so, fighting Blackgate is a somewhat uphill struggle. I was rather hoping that we might drop a tier this week (not supposed to say that but I know I wasn't the only one) but in the end our hard work paid off and it was Jade Quarry that went to T2. This week we get to fight Dragonbrand - or we do if Blackgate permit. We're in third again overnight but we always do badly at reset and right across the weekend. It's going to be another interesting week in WvW. All of the above and more explains why there have been fewer posts than usual of late. My work schedule was at its least blog-friendly and the free time I had I wanted to give to gaming not writing about gaming. That's signifies a very sound success for Mike O'Brien's first foray into single-handed control of the game. 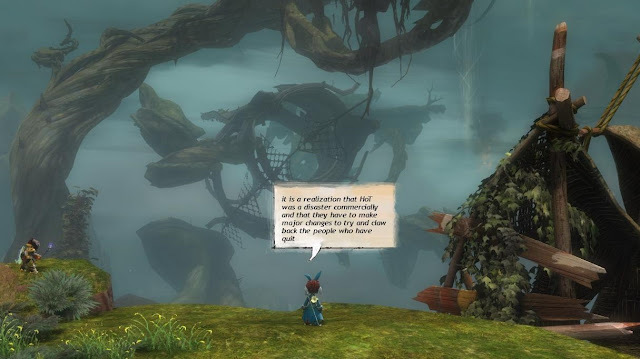 GW2 almost feels like the game it was at launch. Let's hope it carries on this way. The reset volatility and deviation values will come into effect at the end of that match. Worlds that win, especially by a large margin, will have their rating increased by a larger amount than normal. Likewise, worlds that lose, especially by a large margin, will have their rating decreased by a larger amount than normal. The result is that when a world no longer is meant to be in a specific tier, they’ll move out of it more quickly. As a direct result, Mrs Bhagpuss and I spent most of this weekend in The Mists, joining in a largely futile attempt to hold the line against the resurgent Blackgate hordes. As I write, around fifty hours into the match, Yak's Bend is in second place, 4k ahead of Jade Quarry and just short of 50,000 points behind BG. Yak's Bend's has never been at its best either at reset or across the weekend. We often start the working week a little behind and have to go hard to pull out a lead during the week. That trend goes back almost as long as I've been on the server, which is always. Usually, though, the deficit is a few thousand points at most. Last weekend, with the changes imminent, we came out of Sunday chasing a 38k lead. This Monday it's 48k. 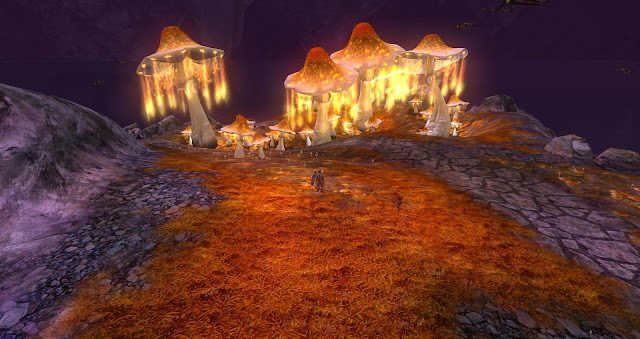 Like the enormous queues that caused a flurry of angry forum threads on Friday night and left a lot of people disgruntled all through the weekend, the large influx of people logging in to play WvW isn't entirely down to the linking of servers. 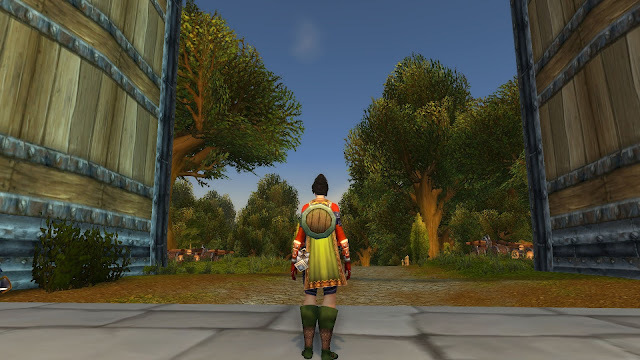 In Tier One the addition of low population worlds like Anvil Rock and Eredon's Terrace to the mix probably has less impact than the transfer of one or two large guilds from one T1 server to another. Indeed, as could readily be seen the weekend before the patch, most of the effect was caused by dormant accounts waking up as lapsed players (or, at least, lapsed WvW players) logged back in to see what all the fuss was about. Blackgate, with a long history at the top, has a lot of dormant WvW accounts. The primary, immediate result of the change has been a tidal wave of action. All four maps were in highly active play all weekend, with multiple zergs and blobs from all three servers circling the borderlands. In the larger battles, when two fifty-strong squads clashed over possession of a keep or struggled to take or break a choke point, my aging PC almost gave up altogether. Playing a berserker staff elementalist, the classic glass cannon, going into slide show mode and losing any control over placement, movement or reaction should make the game unplayable. My character ought to be dead before I can see an attack coming. That she managed to survive any number of battles without being picked off and eliminated while helpless suggests that there are plenty of other players struggling to cope with the conditions. 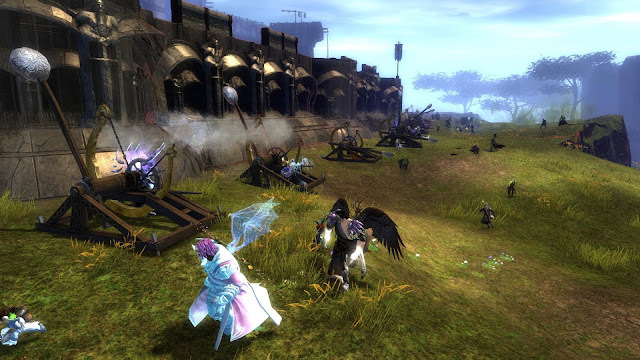 This, of course, is how WvW used to be, years ago. This is why, back then, we rarely went to the most popular and populated map, Eternal Battlegrounds. Fighting in Stonemist Castle, the centerpiece of that map, often contested by all three zergs at once, used to crash the game for me with tedious reliability. As GW2 in general and WvW in particular has bled out we have all come to accept and expect things to be quieter, more sedate. As Yak's Bend first ascended and then was shoved further up the ladder we heard a lot about Tier 1 and its high population. 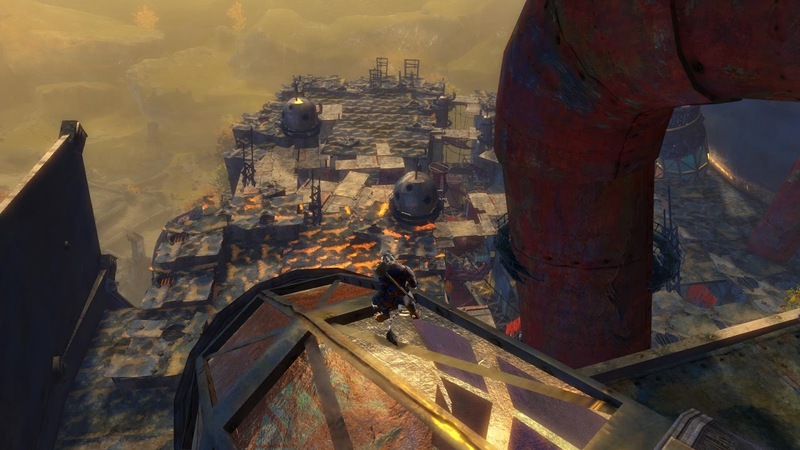 I expected major problems with my old hardware when we finally got to the top but our rise to glory coincided exactly with the arrival of Heart of Thorns, whereupon WvW numbers fell off a cliff. 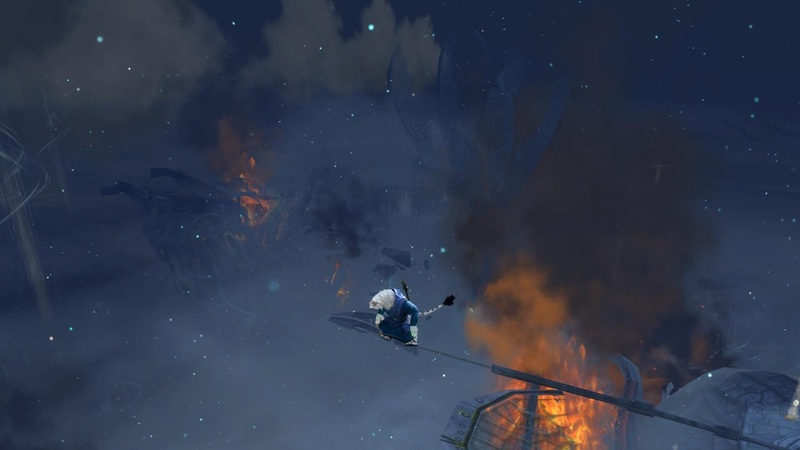 And as we all know there's no gliding in WvW. Consequently these gigantic battles come as a bit of a shock. They are also by no means universally welcomed even by those who don't have technical issues. 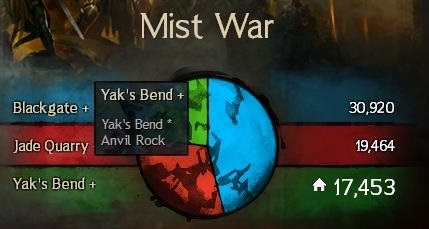 Gameplay in WvW has long been diverse. Although it's a game mode seen from the outside as a primitive clash of zergs, the format hosts a wide range of playstyles. There are roamers who travel alone, hoping for single combat opportunities. There are havoc groups of two, three or half a dozen, hopping maps and hitting hard behind enemy lines. There are scouts sitting in towers and keeps, tagging siege and reporting on enemy movements. And, of course, there are the merry PPT crews, battling doors and walls and NPCs for the good of the team and their own karma. As of now, most of those activities are on hold. Structures are barely defensible when fortified. Below that you can forget it. Even a well-drilled response team can't handle multiple roaming 30+ zergs on both sides of two or three maps at once. On Saturday havoc teams had to run twenty deep to have much hope of taking even a couple of camps. As for solo fights it is to laugh! If all this comes as something of a shock to the system for players used to life in the top tiers, imagine the trauma for the conscripts from T8. Impressively, the Anvil Rock players we've picked up seem to have taken it in very good part. A good few have outed themselves in map or team chat and I'm happy to say that the response from Yak's Bend has been exemplary. We may be vilified for our gameplay but we have always had a well-deserved reputation as an open and welcoming server with little time for drama. I ran for a while on Saturday with a very nice guild from AR who seemed to be enjoying themselves a lot and there have been several AR commanders tagged up, which is great to see. Over on Blackgate the story hasn't been such a happy one, at least according to the forums. There are some eloquent and impassioned posts from distressed Eradon Terrace exiles that explain very clearly why world-linking, good though it may be for the health of WvW in general, could be catastrophic for established server communities. There do seem to be some major flaws in the plan. Freezing the glicko score of the junior partners, removing all visual signs of their previous identity, the knowledge that any pairing may be changed, perhaps as often as four times a year, all add up to a class system for WvW. A lot of players are going to feel like refugees, conscripts or second-class citizens. Even at best they are going to feel like guests or junior partners. 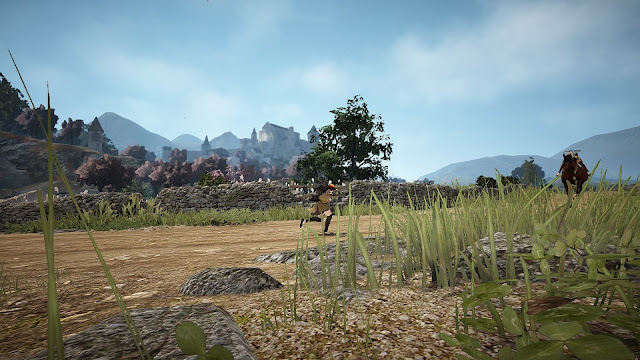 For players who transferred to lower tier servers specifically to escape the overcrowded upper levels or in search of specific types of gameplay, mainly roaming and small group fights, that were better supported by a low population, this must be particularly galling. Especially given that money changed hands to facilitate the move. This, though, is the risk you take by choosing a low population environment in a commercial MMORPG. In my experience, low population servers often have tighter communities, better atmospheres and offer gameplay options that are hard to find on busier worlds. I always prefer to play on a low population server if I can find one. The trade-off for a better quality of life is insecurity. Low pop servers get merged. If you're lucky, when that happens, you might get a choice about where you go but sometimes you just have to go where you're put. I feel for the displaced of Eredon Terrace. My third account is on Ehmry Bay. EBay is now twinned with Henge of Denravi, a server I would never in a million years have chosen to support. Every time I log in to do my dailies I have to think twice to remember which is supposed to be my "home" borderland. I will not miss Fire Keep. If I'd woken up on Saturday morning and found that I had to log into another server to play, though, I am certain it would have diminished my enthusiasm. I might have decided to go play Black Desert instead. As some of us have been saying this weekend, trying to raise the spirits of certain disheartened players who are already finding the blobbing and the queuing and the lag to be more than they bargained for, it is only a beta. Over the next few weeks things will settle. The novelty will wear off. The dormant accounts will go back to sleep. The scores will adjust, worlds will find their level, things will go back to normal, albeit a new normal. Then the Alpine Borderlands will come back and the whole frenzied cycle will begin over again. Interesting times. Fun to look back on; not so much to live through. If there's one thing I've learned, though, it's that I really need a new computer. 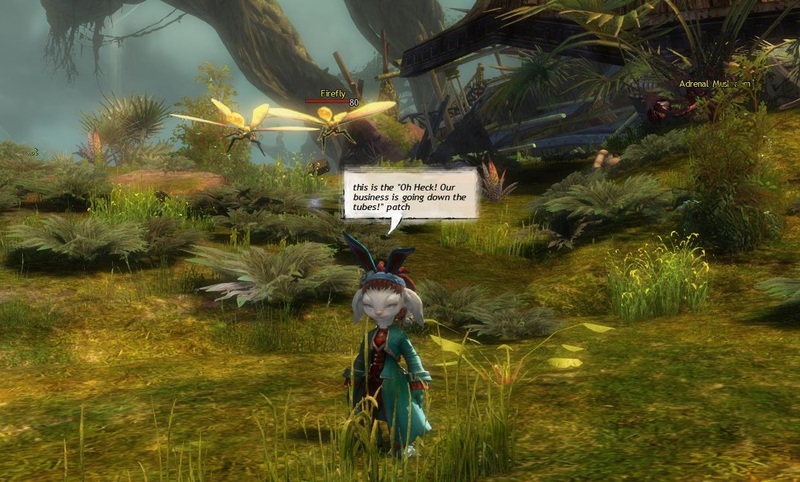 GW2's Spring Update dropped on Tuesday and so far the reaction seems mostly positive, which might be a first. As expected, there was little in the way of new content, with the meat of the patch being system revamps and revisions. 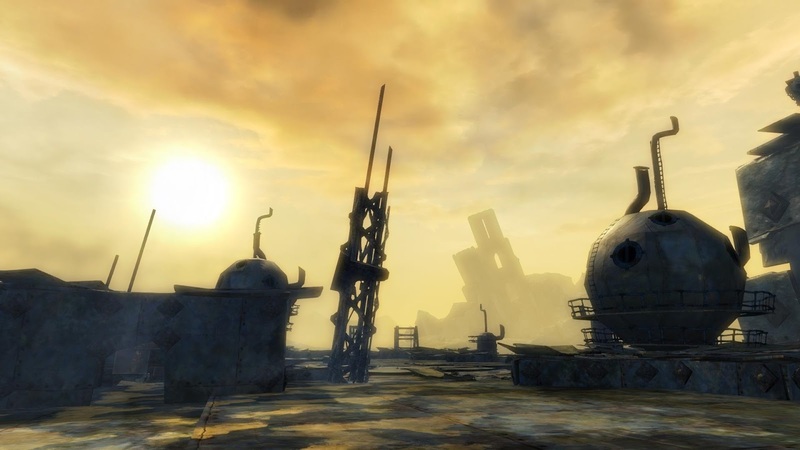 The parts of the game under focus were World vs World and the Heart of Thorns maps, all of which received substantial makeovers or, in the case of HoT, nerfs. Seldom can such extreme pruning and cutting have been greeted with such enthusiasm. The ever-unpopular Desert Borderlands had their barricades torn down, their bridges widened and their annoying House of Fun mechanics toned down or switched off altogether. Where once awkward jump pads or dangerous scrambles provided the fastest routes now hastily bodged-in ramps make access to key areas faster and less fatal. That all went down well with everyone other than the awkward cusses who professed to have liked the DBLs all along, although I can sense a certain nervousness around the impending return of the Alpine Borderlands among those who can now see the potential in the new maps that was previously hidden behind the Extreme Sports aesthetic. 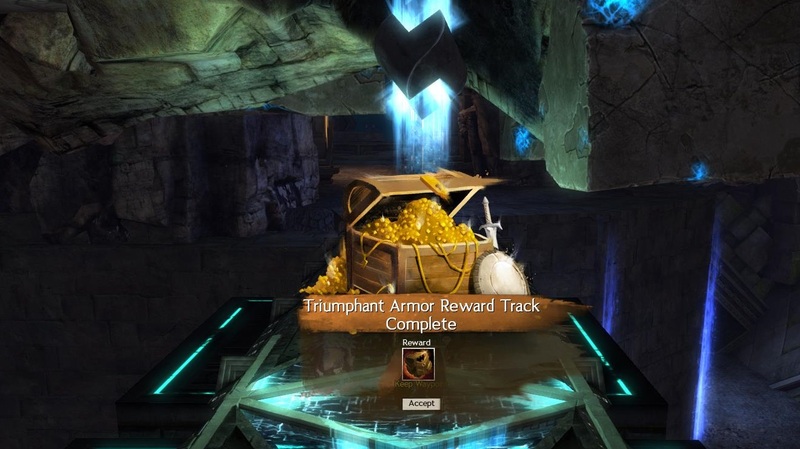 Almost universally welcomed was the addition of sPvP style "Reward Tracks" to WvW. I've long been of the belief that adding extrinsic rewards to game modes in order to encourage more people to try them is counter-productive. There's some real-world evidence for this. Given that "lack of rewards" has been one of the top three complaints about WvW since launch, though, rather than fight the concept I can only comment on the execution, which is not at all bad. It's a cut-and-paste from SpVP, for sure, with just one new track specific to WvW added, but it adds some flavor and more stuff is more stuff, however you cut it. One very clever move was giving Commanders the option to allocate a portion of the reward credit accrued by a squad to specific squaddies, who might be away from the main action on guard or scout duty, tagging siege or walking the commander's basenji. The main problem with that is that it feeds off a new "Participation" mechanic, whereby players' activity is tallied over the fifteen minute intervals between "ticks", finalizing and handing out permanent reward credit only at the "tick", when the War Score is incremented. That just happens to be the exact same mechanic that this patch removed from the PvE Heart of Maguuma maps (the new, official, name for what has sometimes been referred to as Magus Falls). A little consistency would be nice. 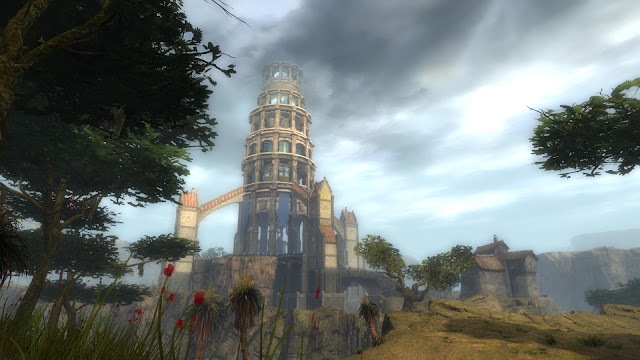 Last night the second shoe dropped for WvW as server merges world linking redued the number of competitors in the North American league from twenty-four to a round dozen. Yak's Bend linked with Anvil Rock, which made about as much difference as an eye-dropper does to an ocean. My third-account server, Ehmry Bay, linked with Henge of Denravi, which might be a tad more noticeable. Gone are the days of wandering around doing dailies and taking camps without seeing a red name, I fear. It hasn't been half a day yet so how all this will pan out is anyone's guess but by far the strongest reaction on the forums was outrage at the huge queues, hundreds strong and hours long, that most servers had at reset. I suspect that will be seen as a big win at Anet Towers. If nothing else the changes will have at least attracted the interest of a lot of dormant players who are now piling back in to see if the game they didn't like enough to keep playing has anything left to offer. That, in a nutshell, is the overriding theme of the Spring Update: do whatever it takes to get people back through the doors. The suspicion is that Heart of Thorns under-performed at launch and then proceeded to tank hard, dragging the rest of the game down with it. Colin Johansen fell (or was pushed) onto his sword, leaving Mike "Two Hats" O'Brien to awaken from his slumber, remount his shining charger and ride in to Save The Game. And on this evidence he just might. The WvW changes, while not by any means perfect or complete, have been better received than anything done for or to the game mode since launch. The threads on the Forum are positively glimmering with faint praise. As for the downgrades to difficulty and upgrades to rewards for PvE in Heart of Thorns, if map chat is anything to go by people there are even happier. No longer do you need to commit a minimum of an hour, maybe as long as two, just to be sure of getting the loot you came for. Participation has been replaced by straightforward as-it-happens, by the event rewards. You can drop in, do two or three events and leave or you can stay all day; it's up to you. Either way you get something worth having. And what you get has improved. A lot. The reward tables have been fleshed out and plumped up. The various chests have more in them and better. The event rewards have a chance for desirable drops including Ascended items. The rate at which the various map currencies accrue is many times faster. There's a permanent 50% increase in xp for killing mobs, the hated "diminishing returns" debuff that discouraged farming and grinding is gone, there's increased frequency of access and reduced difficulty for Adventures. Many existing events have been restructured and many new events added to facilitate solo and small group play. I soloed one Veteran mob last night that was flagged as an event. It took about twenty seconds (berserker staff ele - ymmv) and I got better rewards than I would have expected from fifteen or twenty minutes of Old HoT. Oh, and you now get a free upgrade to level 80 with every purchase of Heart of Thorns, complete with all the gear you need and all the waypoints opened so you can jump straight into the expansion content without any of that tedious leveling nonsense. If you already have HoT and all your character slots are filled with 80s, don't worry - you get a big pack of goodies including dyes and some gold. ANet are on a major love offensive with this update, that's obvious. The "new" regime is clearly prepared to break with any and all of the precepts of the team that got us to where we were until last Tuesday. The new mantra is "give the punters what they want". 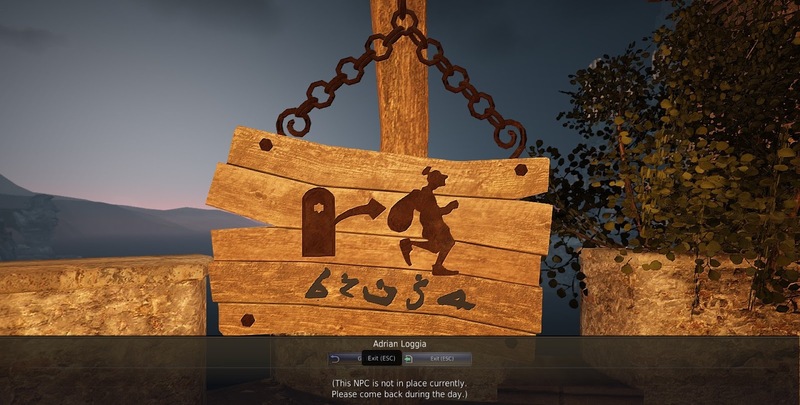 We even got autoloot in WvW and our old fireball graphics back. It's almost as though someone was actually listening to feedback! Take dungeons: I don't do them myself so I have no anecdotal evidence to offer but it looks as though there has been a complete climb down on the aggressive decision taken months ago to all but kill that game mode off. Now the talk is all about how that was "unnecessary" and there are new rewards and plenty of encouragement to get back underground. There's more - a lot more. It's all in the mother of all patch notes if anyone wants the full details. The key takeaway, though, is that this seems to be about the best-received update I can remember for the game and that's almost entirely down to a complete 180 degree change of direction. This update acknowledges what the majority of players and commentators have been saying for half a year or more: Heart of Thorns was misconceived, aimed at the wrong demographic (and missed it, too) and was bad for the future of the game. I actually liked HoT a lot more than I expected but I'm certain I'd have liked it a lot more, even than that, had it launched in this latest version. The "Buy Heart of Thorns" pop up is back in the corner of the screen for my non-HoT accounts. Having done the unpleasant and humiliating work to make the expansion more palatable to those players who voted without their wallets, ANet naturally want to reap the reward of more sales. I would already have recommended HoT because, as I said, I've enjoyed it and I feel I got my money's worth long ago. This re-envisioning is even easier to recommend. It's slicker, more polished, better-targeted and more accessible. Whereas I previously had no plans to add HoT to my second or third accounts, not because of the value but because I wouldn't have wanted to repeat the required grind, now it's quite likely that one or both will receive the upgrade at some point. 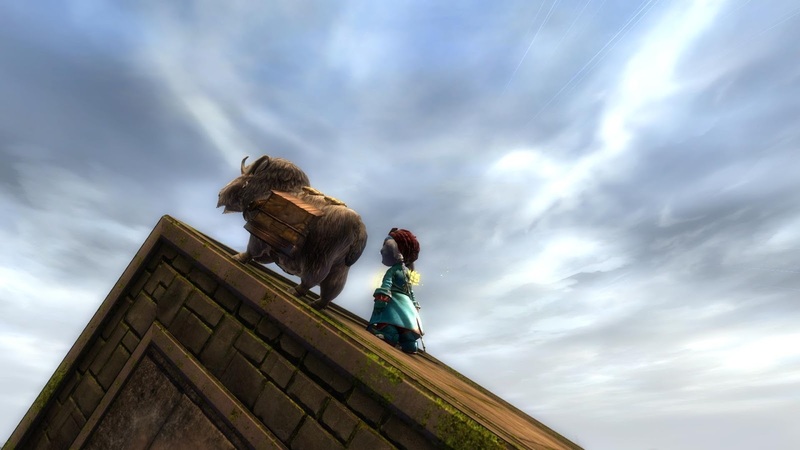 GW2's Spring Update isn't a second coming on the scale of FFXIV:A Realm Reborn but it's a major change of direction that bodes very favorably indeed for the second expansion. If they really have learned their lesson, as, on this evidence, it appears they may have, then the next expansion could be a real cracker! 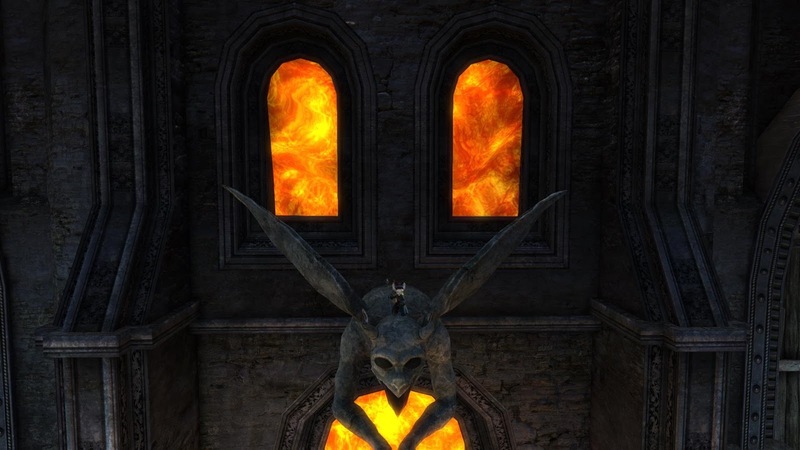 The Patch Notes for EQ2's upcoming Scourged Wastes update are available right now for the Test server, although the patch itself hasn't yet arrived. I learned this as always from the invaluable EQ2Wire. It's Update 100, which might explain why it's such a major content release, although if so Marketing has been surprisingly shy about making a big deal out of that triple-digit landmark. Feldon doesn't comment but it strikes me that this is quite significant. Or could be. Ever since LoN went live back in 2007 its main function has been to provide in-game loot for EverQuest and EQ2 players. Oh, there was a time when significant numbers of people played Legends of Norrath as a game in its own right and for all I know they may still, although I'd want to see some convincing evidence before I'd believe it. As far as I can recall it has always been playable outside of the game from a standalone client although I have never until today even visited the web page, much less thought of installing it. When LoN first appeared in game I played through the tutorial, which I remember finding very confusing. I never progressed as far as a match against another player. After a couple of desultory games with the AI I gave up on LoN as a game-within-a-game and thereafter never gave it much thought other than as a source of free stuff via the occasional Loot Card. There was a period when LoN provided actual dropped loot in game, too. 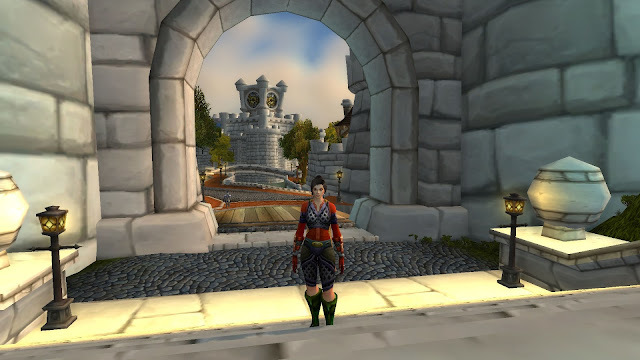 Back in 2007, which seems insanely longer ago than nine years as I recover these memories, I must still have been playing EverQuest as my primary MMORPG, because I clearly recall Booster Packs for LoN dropping as loot from mobs while I was hunting in the Crypt of Nadox and other Legacy of Ykesha zones. Those packs were tradeable and they sold for big money on the broker back then. 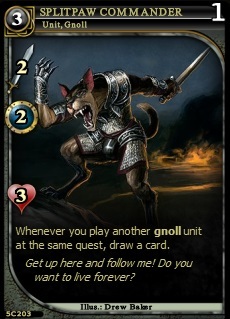 Not, I think, because anyone wanted to expand their deck to play LoN. No, the premium price was for the chance of getting something like the Bot Made Ice Cream Cart , still one of the coolest items ever added to the game and one of the very, very few I have always coveted. At some point, either at the beginning or very early on (I can't recall which and the brief wiki entry doesn't mention it) a stipend of five LoN cards per month was included with the All Access sub. Ever since then opening and hoping has been a monthly ritual of my EQ and/or EQ2 gameplay. 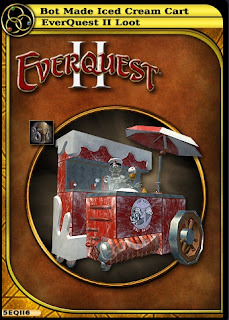 Over the years I've had a few nice "drops" including mounts and houses although never the elusive ice-cream cart. A while back the rules were changed so that you had to log in each month and claim the free cards (also your 500 Station Daybreak Cash) because the entitlement no longer rolled over and since then I don't think I've missed a month. The terse patch note doesn't mention anything about the stipend but I have to wonder: if the games have been de-coupled, what is the future for the free packs? I'd like to know. I did try logging in to test it for myself but although the patch notes may be up the patch itself is not. The process for logging in to Test is unbelievably easier and smoother than it used to be back when I played, though, so I'll try again later. In the meantime I've downloaded and installed the standalone client and tried it out. It seems identical to the in-game version except that it's slower and very laggy. You'd think that would be the other way around. I opened packs until I got a Loot Card. It took me seven tries, which is about average in my experience. The loot is now in my account Claim list so I guess that, for now at least, the only substantive change is the access method required. I'm off to post about it on the forum. It seems like something that should have been handled a little more sensitively than with just a line in the Test server patch notes but that's SOE/DBG all over. The list of MMOs that I like to imagine I'm still playing that was included in Saturday's post, stopped at a nice, round dozen. The thirteenth seat at the table could have been taken by a number of other titles but the front runners might easily have been Allods or Villagers and Heroes. 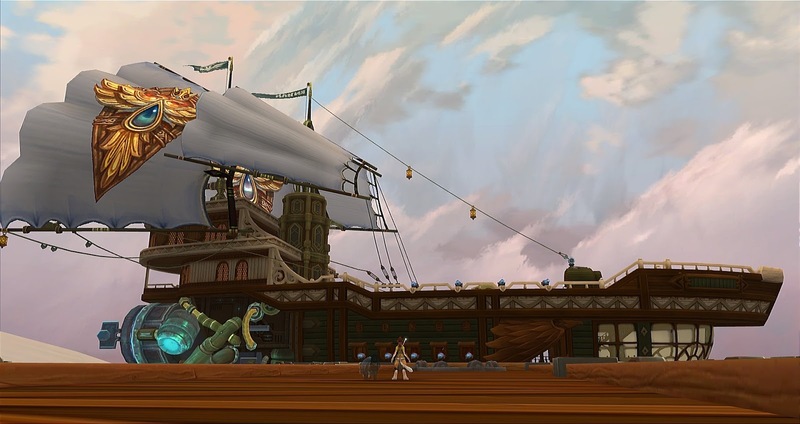 Allods is a game I have never given as much time as I would have liked. Mrs Bhagpuss and I played it in beta and enjoyed it a great deal. For a while it was effectively the main MMO we were playing. We each had several characters and we leveled into the mid-thirties, far enough to see some dungeons and take part in the mid-game's open world, non-consensual PvP. Those characters, of course, were all wiped when the beta ended. We re-rolled for launch but second time around we didn't last long. As I remember, it wasn't the infamous cash-shop shenanigans that put us off, just the usual "I just did all this last month" beta-tester's ennui. That was Mrs Bhagpuss's last run at Allods but I've been back twice more. The first time was to take a look at the soviet-inspired Empire side of the fence, having always played League before. The second was both to try the new race and its starter area and to test out the viability of playing a full scale MMO on my new 10" Windows tablet. The concept of playing MMOs on mobile devices has fascinated me for a long time. I first blogged about it back in 2012, when I was playing Pocket Legends and Elemental Knights on my iPod Touch. I'm still using that iPod to listen to music and podcasts and I even occasionally watch YouTube but I stopped gaming on it not long after I wrote that post. At the time I thought it was the combination of small screen size and not particularly interesting games that made playing an MMO a less-than attractive option for lunch-times and commutes. That explanation didn't hold up very well when I got a tablet capable of playing full-scale MMORPGs like Allods and even WoW. Of course, MMOs made for the PC aren't generally optimized for touch-screen gaming. WoW plays smoothly on my tablet, which is easily powerful enough to run it, but to play normally I need to attach a mouse and keyboard, by which point I am effectively playing on a netbook. There are apps that you can install to emulate mobile controls for PC games and I have tried a couple but although they work to a degree the whole process feels awkward. Allods turned out to be the most enjoyable of the MMOs I tried on the tablet because all the innate PC controls that allow for click-to-move or click-to-use seem to respond perfectly as touch-to-move or touch-to-use. So, I could play Allods comfortably on my tablet, it looked great and I like the game. And yet I only played it a couple of times then forgot all about it. It seems that I don't really want to play MMOS, or any other games, during those short periods of free time I have during the working day, after all. Turns out I'd rather read a book or web-browse. I only thought about gaming on the go again this weekend for two reasons: the first was when MassivelyOP reported that another MMO I like and wish I'd found time to play more of, Villagers and Heroes, is getting a full port to the Android platform. The other was I dropped my tablet and broke it. Following the life/lemons/lemonade principle I used the accident as an opportunity to upgrade. I found something with a much better display, a more powerful cpu and graphics and more memory for almost exactly what the tablet I dropped cost a year ago. That's technology for you. Best of all, the replacement comes with a dual-boot option, Android and Windows, already installed. That should give me the fullest access to whatever the next couple of years holds for mobile gaming, short of anything that releases as an iPad exclusive. It will be interesting to see what the new tablet can cope with. 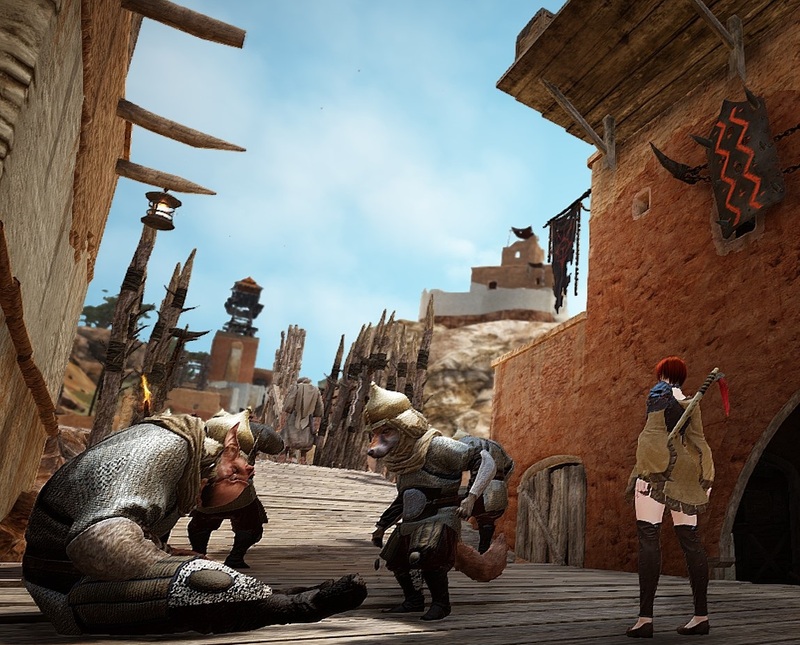 Black Desert, for example, could be an ideal mobile MMO with its extensive range of automated options and afk processes. Then there's GW2, which has a highly paternalistic patcher that refuses to run if it finds your system doesn't meet its exacting standards. The old tablet couldn't pass the examination but if the new one can it would be handy to be able to log in at work if just to be able to chat in guild. In the end, though, I suspect that, no matter how good the choice of MMOs becomes, how powerful and affordable the hardware gets, however smoothly and efficiently everything runs, I'll always end up choosing to use my tablet for something other than gaming. It is possible to have too much of a good thing. On the other hand, it's also nice to have a choice. It seems like, after a number of false starts and failed promises, the age of the Mobile MMO might be here at last. I'd rather be able to play MMOs on my tablet and not want to than want to and not be able. Conspicuous non-consumption! it's the post-capitalist way! April's proving to be a very busy month indeed, at least for the sadly-diminished number of MMOs I seem to be playing these days. How it's happened that my gaming diet has been pared down to just two regular titles I'm not entirely sure but I am sure that I don't like it and didn't intend for it to happen. Whether I have the power to change it is another matter. 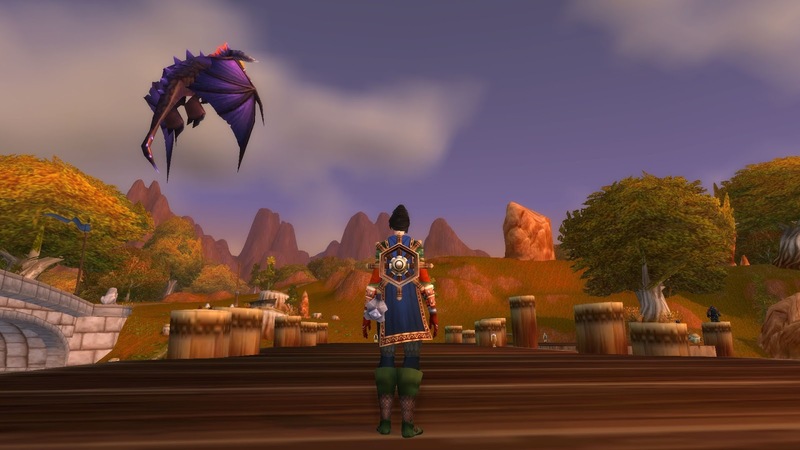 It's a truism that you can only play one or two MMOs "seriously" for two, simple reasons: firstly, the genre is based primarily on extremely time-consuming activities and secondly, those activities never end. A single-player RPG offering 60+ hours of gameplay would generally be considered good value. It might well be the only game a player booted up for a whole month of multi-hour sessions. After a while, though, people are done with single-player rpgs. They're finished. They move on. Where are all the posts in my Feedly now about Fallout 4? Gone to the same place all the posts about Skyrim, I imagine. That tends not to happen when a player reaches the end of a single-player game. When you're done there, you're done and anyway it's no-one's business but your own. You either had fun or you didn't. It was money well spent or it was a poor purchasing decision but either way it's over. Off you go to the next one. I admit it. 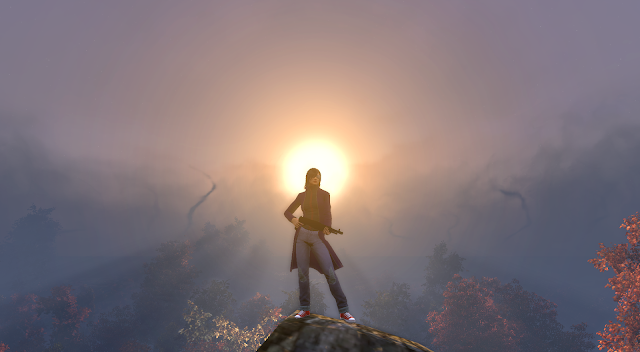 I do sometimes log into TSW just to take screenshots of my character posing. Ok, Ninelives isn't actually an MMO. Indeed, it's so much not an MMO that the SmokymonkeyS team feel compelled to state "It will never be a MMO" at the end of their bullet point on the planned Multiplayer features. It might as well be an MMO, though. That's a nice, round dozen, of which, quite clearly, I'm really only playing the first two and mostly only the first one. I would dearly love to be able to say I was actively and meaningfully playing a dozen MMORPGs. I've been trying to do that for years. I've been telling myself I was doing it and I very nearly made myself believe it, too, but let's face facts here. At best I'm logging in to a dozen MMOs. Of the list above I think, again without checking, that I've fired up the client and taken a character into the world in nine of the above twelve games this calendar year. Remind me who Argenta is again? The Secret World and Dragon Nest :Oracle are the other two I haven't touched at all in 2016. I love TSW in theory but I hit the wall of my ability to progress there a long time ago and since I'm not going to get any better it's a dead end. It's not a gear issue - my character is overgeared already for the content I can't beat. I just can't play the game well enough to get past certain fights in the storyline and since all new content is now, quite rationally, directed at the existing, skilled and highly-progressed community, its unlikely I'll ever return to do more than potter around the places I've already seen. Which is fine. I do that in a lot of MMOs. It's tourism and I am one hundred percent down with being a tourist in both real and virtual life. I can hardly claim it's the same as "actively playing" an MMO, though, can I? Of the remainder of that list I did play Blade and Soul "properly" for several weeks. I would almost certainly be playing it now if Black Desert hadn't risen from the MMO ocean like a great leviathan and stolen every single minute of free time GW2 wasn't already using. I will return to Blade and Soul. I was enjoying it, I can play it, I wanted to hit max level just to say I'd done it. Not right now, though. Similarly I will play Project Gorgon, just probably not until it settles down to some kind of quasi-released status and I will play Vanguard (again), when most of the gameplay is recovered from the void. And Dragon Nest; I will also get back to that one at some point, I'm sure. But when? When is any of this going to happen? There's already a line forming for the games I am playing. A leap into the content abyss. On Tuesday the April Update for GW2 lands. What's in it? Your guess is as good as anyone's. ANet, now under Mike "Two Hats" O'Brien's complete control, has opted for a bizarre combination of openness and secrecy, in which Mo (as he confusingly styles himself these days) announces he is going to communicate more while simultaneously shelving some of the established communication channels we've all come to rely on. Consequently we have no clear idea what's going to be in the update, other than whatever you can read from the runes of this terrible promo video. The worst promo video I have seen for... well, possibly ever. Whatever the update brings, I imagine it will manage to occupy my attention at least until April 28, when the mother of all free updates drops in EQ2. Contrary to ANet's approach, DBG have been pulling out all the stops to provide full disclosure on what to expect and, on paper at least, it looks awesome. Seriously, this deserves hyperbole. They could be selling this as an expansion and I doubt they'd be getting much more in the way of complaints than they always get. Feldon has been covering the DBG infodump, which is far too extensive to detail here. The highlights for me are the new open-world zone, the Experience Vial system (which I expect to use heavily if it turns out to be as great an idea in play as it reads on the screen) and the Collects they revealed today. There's a lot more to the update than that, though. If this is what they're giving out for free (well, to Subscribers as part of their Subscription, to be strictly accurate) then I really want to know what they have planned for this year's actual expansion. If they make that fox race playable then all bets are off. And finally, just focusing on the triumvirate of MMOs I can get away with saying I am "actively playing", while keeping a straight face, there's Black Desert. Apparently throwing in an entire "expansion" unannounced earlier in the month wasn't enough for Daum. They're sweetening the pot further on April 20th with two new classes, the controversially-named Musa and Maehwa (better than "Plum" and "Blader" as the translated versions had it, that's for sure). I rolled my third BDO character, a Witch, the other night. I already had a Berserker, who I don't get on with, and my Tamer, who is great. I like the Witch a lot so far. I haven't even had a chance to consider the two new ones although I still have one character slot free and anyway that Berserker is hanging on by his fingernails - he could fall onto the Delete button any time. He's probably safe for now, though, because the thing is this: there just isn't time to be starting new characters. I need to buckle down and get on with the things I have in hand already. The dream of really "playing" many MMOs at once is just that: a dream. It's a good dream though and I'm going to keep on dreaming. Who want to wake up to reality anyway? I was on Reddit last night reading the leaked/faked (delete as applicable) upcoming patch notes that supposedly reveal details of ANet's plans for server merges and other "fixes" for World vs World's many problems, when quite by chance I came across a thread entitled "Thank you ANet, for polishing Black Citadel. It's beautiful." Putting aside my mental image of a team of ANet developers in community service fatigues hanging from the girders of The black Citadel on bucket-chairs wielding mops and dusters, I read on to learn that, as a direct result of the addition of gliding to Core Tyria, someone had taken the time and trouble to "polish up, rework the newly accessible areas a bit" and sort out "invisible walls, low res props without collision, etc that needed fixing". The Black Citadel has always been my favorite Tyrian city. I've sung its praises before, more than once. Over the years I've poked my whiskers into its many back alleys and wild places. But I've never seen it from the air. This evening I spent an hour exploring the old place. Honestly, I couldn't with any certainty say what parts were or weren't newly accessible. The place always was a maze. For example, I'd have said the whole perimeter of the Great Imperial Smelter would have been unreachable without a glider but as I made my way back on foot from the far side I found myself next to a vendor and next to him was a ramp going up, so maybe you always could take that tour. It's also not impossible that you might have been able to jump down onto the jury-rigged, flat, riveted rooftop of the Gladium Canton, although I rather doubt it. In places the collision is still touch and go - I fell through what looked like a sheet of solid boiler plate steel while I was gawping at the sunset. I purely love rooftops. There's a famous romance to the world above the houses that's been celebrated in many a book and film from Mary Poppins to Rooftoppers. As a teenager I used to take every chance I could get to climb out of a window or up a wall and sit on a roof ridge or a parapet. I'm getting a tad past that now but my characters aren't. The roof over Gladium is a joy, although it's also an architectural disaster. I really hope no Asura "geniuses" ever happen to see it, but for atmospherics and mood it can't be beat. 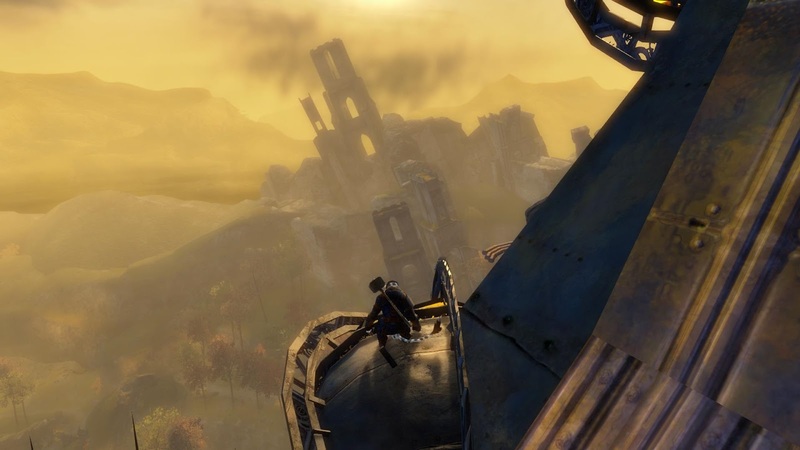 There were two places I managed to reach that I'm certain weren't on the tourist trail before gliding came to Tyria. To the South of the Gladium Canton there's a sector from which the map's fog never clears because no-one was ever meant to go there. It was scenery. Now it's a picnic spot. There's not much there except trees and grass but it makes a great staging post to swoop down on that tricky vista. 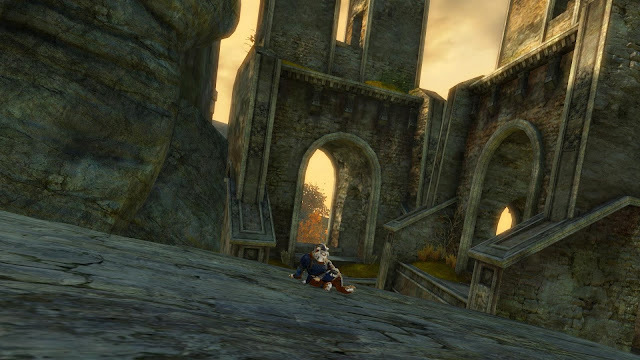 Most satisfying of all, though, was the flight I took from the ledge of the Asura Gate to Lion's Arch all the way across to the ruins of the Great Northern Wall. Those fragments of archway have taunted me for years, granite ghosts of a past that won't fade. 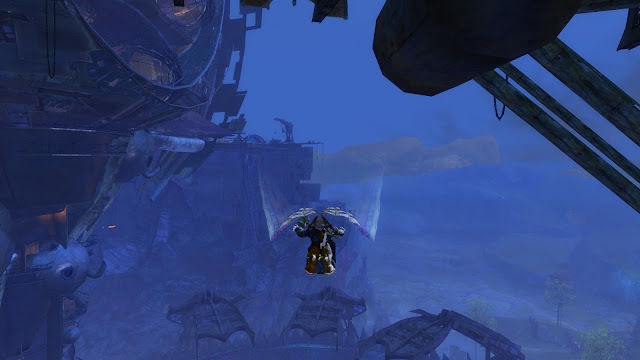 Landing on their ledges and sitting in their shade made an old Charr feel the war was finally over. So, yes, thank you Justin of ANet, for going above and beyond the call of duty and adding yet another paragraph to the palimpsest of The Black Citadel, the greatest city in Tyria. May her steel always shine and her roadways never rust. This weekend I got my loyalty reward for spending thirty days in Black Desert. You'd think that would be long enough to have made up my mind whether I'm enjoying myself. If this was a subscription MMO it would have to be, because right now the first monthly payment would be due. Of course, a month's play often isn't enough to decide the future of an MMORPG. When Mrs Bhagpuss and I played Final Fantasy XIV: A Realm Reborn at launch, by complete chance the first subscription payment fell due just as we went away for a week's holiday. As we left we were undecided whether to sub but that enforced hiatus brought clarity. By the time we returned neither of us was interested in picking up where we left off in FFXIV. We both preferred to return to GW2, which we did and where we remain, by and large, almost three years on. Beats riding an oversized chicken, that's for sure. FFXIV wasn't the game for either of us and I can give chapter and verse on why, but I won't, because this isn't a post about FFXIV's shortcomings. Summing up how I feel about Black Desert after a month is going to be a lot harder. For one thing haven't had the benefit of a full week away from both Black Desert and gaming in general to let my thoughts and feelings settle. For another, I'm not sure I can truly claim I've been "playing" Black Desert for a month anyway. Sometimes I wonder if I'm playing Black Desert at all. I wonder if you can play Black Desert. Is it even a game? The month I spent playing FFXIV was a full month of hands-on gaming. I probably logged 25-35 hours a week and all of that was active play. In Black Desert I have an achievement for 100 hours played but it should say 100 hours logged in. 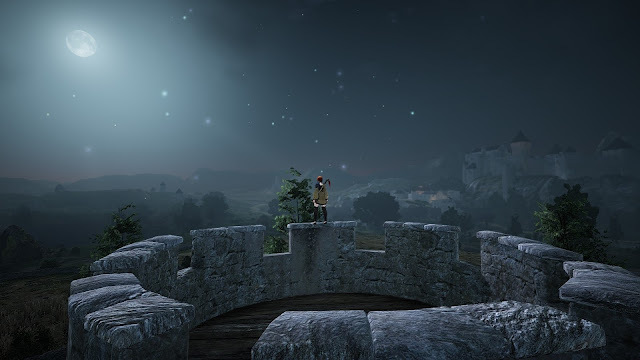 I have, without doubt, spent more hours "playing" Black Desert from the system tray while I actually played GW2 or wrote this blog than I've spent in direct, personal control of my character. With the addition of looping now you need spend even less time playing! Even when I am actively playing BDO I'm mostly not doing very much. My involvement as a player is required only intermittently. I spend a lot of time just watching. I may be at the keyboard but I'm not using it. A good deal of the "gameplay" consists of taking a quest, hitting "T" and auto-pathing there. If it's a normal quest that could take anything from a few seconds to a few minutes. If it's a trade quest, where my character trudges along carrying a heavy pack, it might take the best part of half an hour. 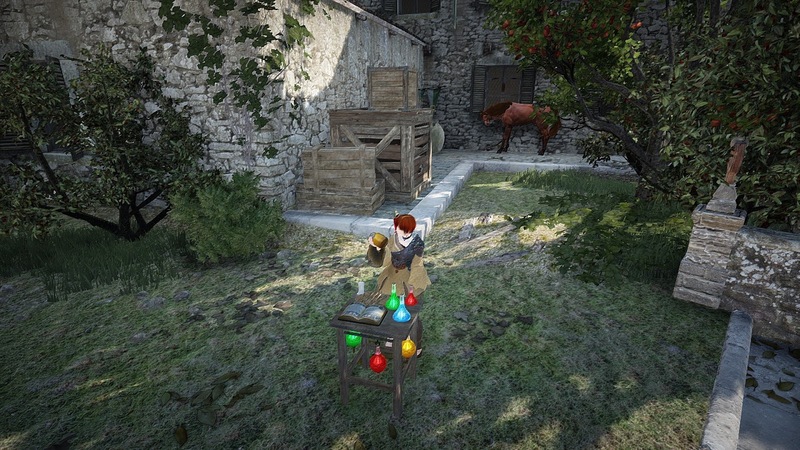 The auto-pathing in Black Desert is exemplary. The best I've seen. There's an annoying exception, where the game assumes you want to go to the source of whatever the quest requires, an area with imps or ash trees for example, instead of to the NPC you need for the hand-in, but other than that, as far as questing goes, you can pretty much just hit "T" and go make yourself a coffee. If you set your own markers, which you can do freely, occasionally you might come back to find your character stuck on a wall. That might make me feel needed for a brief moment, when I tab back in and notice, unstick my character, make sure she's pointed in the right direction, then tab back out again. Simple crafting, somewhat ironically, requires more attention than "proper" crafting. An awful lot of my gameplay in Black Desert happens better without me. The AI fishes more slowly than I do but it never misses a cast, never fails to land a fish and sorts the old boots from the valuable catches far more efficiently than I would. My workers don't need direct supervision. So long as I pop in once in a while and buy them a few beers they get along just fine. There are a few things that do need my personal attention, combat being the most obvious example. Ah, combat... What is there to say about low-mid level PvE combat in Black Desert? It's very fast, very easy and very loud and that about covers it. There's a whole, hugely complex, system of combos and key-presses that you're meant to learn, none of which you need. Frequently you don't need to select or pull mobs because after the mid-teens, whenever you arrive in an area filled with hostiles everything in a fifty meter radius will rush at you like steel ball bearings to an electro-magnet. 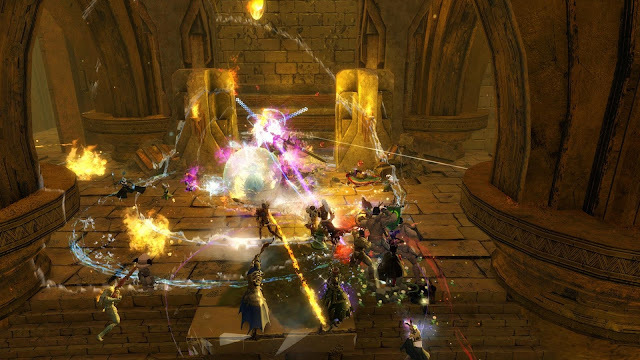 The depth and complexity of PvE combat is exemplified by the many daily quests that start "Kill 50" or "Kill 100". It's a matter of taking the quest, hitting "T", auto-pathing to the middle of the swamp or the field or the camp, waiting a second or two until the imps or fogans or rebels notice, then AEing and chugging health potions until the required number have immolated themselves on your pyre. I have a Gathering outfit that stops mobs like him bothering me but I don't have enough inventory slots to carry it with me. So I just kill them. In fact, the only problem in combat is picking up the loot, which is frequent and potentially valuable or useful enough to make it uncomfortable to ignore. That's why they sell pets that loot for you. I don't have one and I will not be paying real money for one so I do my own looting, which does at least mean I take a few hits while my back is turned; that adds a semblance of danger once in a while. Speaking of loot, inventory space in Black Desert is a major issue. In fact, if there was one reason I might stop playing it's that. Bearing in mind that I love inventory management, that I will literally spend whole days organizing my inventory in EQ, EQ2 or GW2, for me to say that inventory management is a tedious, fun-sucking bore should be a dire warning to anyone who already finds the whole concept of sorting icons into bags tedious. It isn't particularly a question of shortage of space although the basic allotment is measly and the potential for expanding it without spending $1.50 per slot in the cash shop is limited (here's a list). If you add up all the free storage options inluding the inventory on each character you make, all the warehouses in different towns, the warehouse expansions from owning buildings and the inventory slots on boats and mounts and wagons, then in total it probably doesn't fall far short of most MMOs. It gets very dark at night but only for a short while. The sun rises at about 2 am. No wonder no-one goes to sleep. It's just staggeringly, mind-bogglingly inconvenient, awkward, fiddly and annoying. It's an approach that exemplifies my major problem with Black Desert as a game: resource management. When it comes down to it, that's what BDO is - a resource management game. And I was done with those by about 1983. These days I do not want to spend hours and hours juggling resources as a way to entertain myself. It's not entertaining. I enjoy sorting things, putting them in order, filing them away; that's inventory management. This is something else. This is never, ever having enough space and never, ever having what you need available when you need it. This is frickin' infuriating! It's not even as though there's any level of realism to all of this. Like the tableaux of the previous post, having separate bank space in different towns is a snapshot of a reality, not reality itself. The Marketplace isn't bound by time or space like the Warehouse and its overland transport system. Put something on there and everyone can see it. Buy something from there it appears in your pack instantly. This is the only example of an NPC with a life of his own that I've seen but i hear tell there are a few more. This sense of dual values, "realism" and convenience, is prevalent throughout the game and the world. Take the handful of NPCs who put out a sign to say they're not at work right now. Any sense of "realism" that seeks to create is destroyed instantly when you turn around to see the hundreds of other NPCs who stand in the same spot 24/7 to offer whatever service or local color they've been placed there to provide. Anyone could nit-pick any MMORPG to death like this, though. The genre has always suffered under a terrible compromise between the creative, artistic vision behind the games and the unavoidable requirement to compete for custom in a crowded entertainment market. 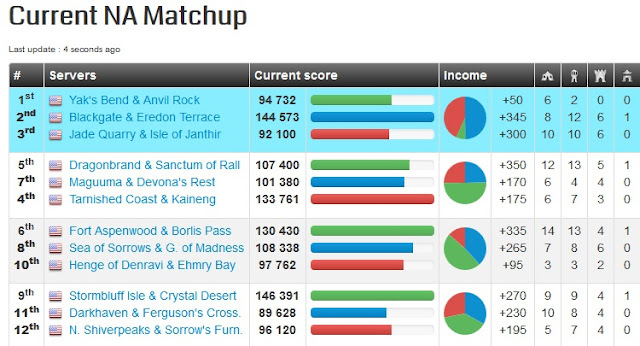 No-one has hit a perfect balance yet so why expect Pearl Abyss to be the first? Black Desert, as a world, is delightful to explore. 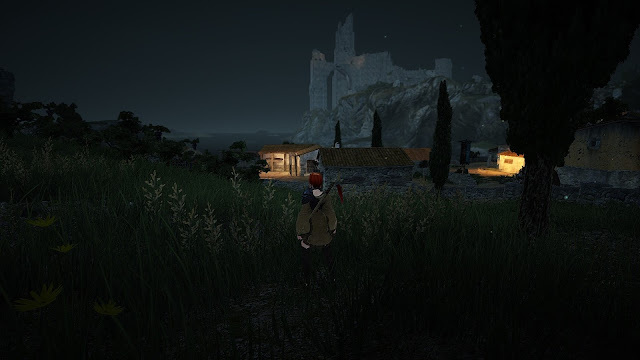 Black Desert, as a game, is relaxing to play. If I had the Energy and the Inventory I'd literally gather all day. It's like visual valium. That's it, pretty much. Other than the space issue, which does verge on being a deal-breaker, most of the other "negatives" I can think of, including all of those listed above, can equally spin positive. I like being able to tab out and read blogs while I travel. I like being able to play other MMOs while I "play" Black Desert in the background. I like the mindless, simplistic combat - or I woud if I had enough space for all the loot. I like the attempt to add some realism here and there, even if it doesn't always convince. I like the housing, even if it can often seem limited, small and dark. I like the gathering, mining, tanning, even though they are incredibly slow and fiddly. I like the Amity mini-game, even if it isn't a patch on Vanguard's Diplomacy. And of course, beyond anything I like the look and feel of the world and the sense that there's always something new and unexpected to find. Sing Ho! for the open road! So, with no more money required to go on playing, I'll be carrying on with Black Desert for a while yet. It's not going to be my main MMO. I may lose interest, wander off and forget about it for a while. With the buy-to-play door always open, though, if I do I know I can always drift back. Let's see where I am in another month.